Happy 2017, everyone!! It's time to say goodbye to holiday indulging -- and hello to making healthier food choices. 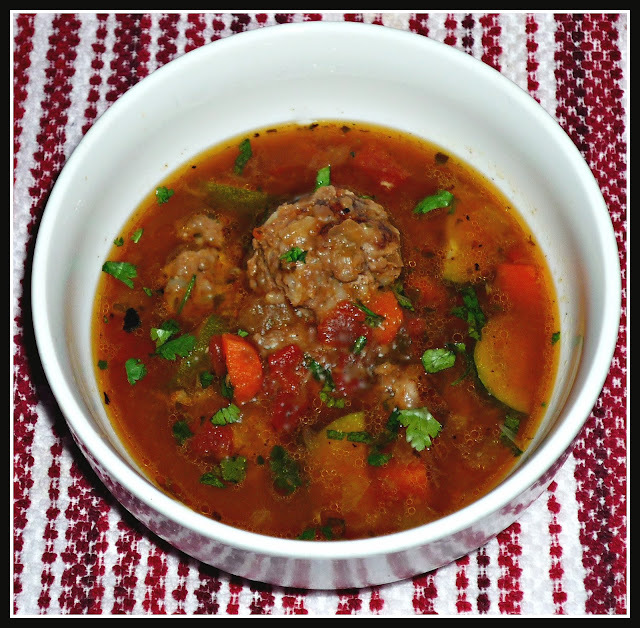 This week, #SundaySupper is focusing on Lean Beef Recipes. Just because you've resolved to eat lighter doesn't mean you have to give up beef! Our hostess this week is Sarah from Chef Next Door, and she asked us to share our favorite light recipe showcasing beef. I knew the weather was turning downright frigid by Texas standards by the end of this week, so I knew I wanted to make a hearty -- yet healthy -- beef soup. 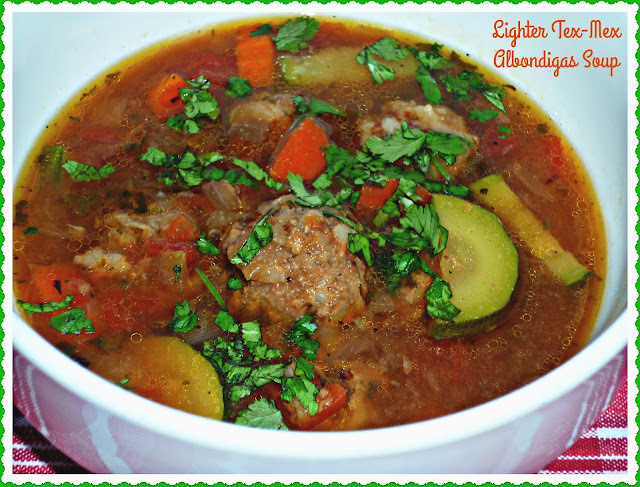 I decided to make a lighter spin on classic Mexican albondigas (aka meatball) soup! This flavorful recipe features meatballs made with 93% lean ground beef and rice. The meatballs are simmered with healthy veggies in a flavorful broth. This is definitely a complete meal in a bowl, and it's bursting with the big flavors we love! The spice level in this soup is moderate, so even those who are spice-averse will love it. To save time, the meatballs can be made up to a day ahead and stored in an airtight bowl in the fridge until you're ready to cook the soup. This is the kind of soup that will fill your tummy...and keep you toasty warm...on the chilliest of Winter days! Step 1: Pour the boiling water over the rice and soak for 20 minutes. Meanwhile, make the meatballs. Saute 1/2 cup of onion and 1 tsp. heart-healthy oil in a 5-quart Dutch oven over med-high heat, until they are translucent and starting to brown. Add the ground beef to a large mixing bowl. Drain the water from the rice and add to the mixing bowl. Add the bread crumbs, egg + egg white, cumin, cilantro, oregano, and salt & pepper. Use a sturdy spoon or pristinely clean hands to combine all of the ingredients. 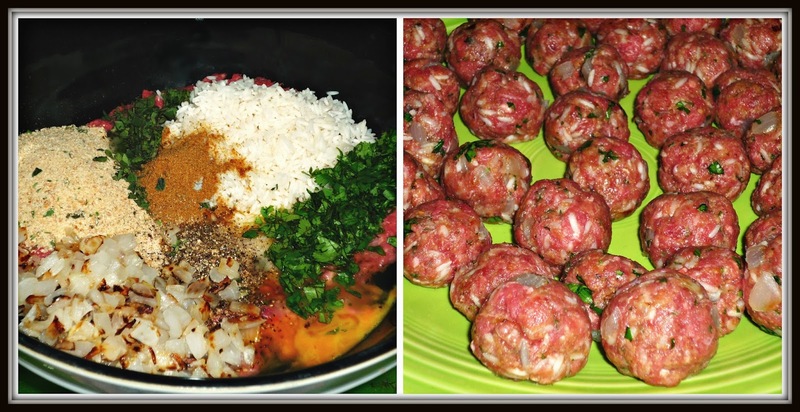 Roll the mixture into 36 small meatballs. Cover and refrigerate the meatballs for 30 minutes. Step 2: Add 1 tsp. of heart-healthy oil to the Dutch oven over med-high heat. 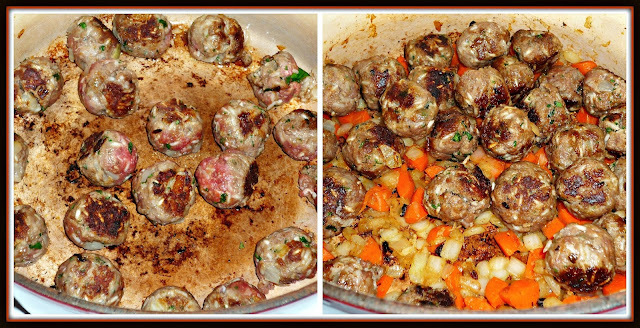 Brown half of the meatballs and remove from the Dutch oven. Repeat with the remaining tsp. of oil and meatballs. Set the browned meatballs aside. Add the final tsp. of oil to the Dutch oven -- along with the onion, garlic, and carrot. Saute for 5 minutes, stirring occasionally. Add the cooked meatballs back to the Dutch oven, on top of the veggies. Step 3: Add the beef broth, diced tomatoes and chiles, and cumin to the Dutch oven. Add salt & pepper to taste. Bring the soup to a full boil (very important to cook the rice in the meatballs!). Reduce heat to med-low, cover, and cook for 45 minutes. Then, add the zucchini. Give the soup a stir, cover, and cook an additional 10 minutes. Step 4: To serve, spoon six meatballs in the bottom of a bowl. Top with some of the cooked veggies. Finally, ladle some of the broth on top. Just before serving, sprinkle with additional chopped cilantro. 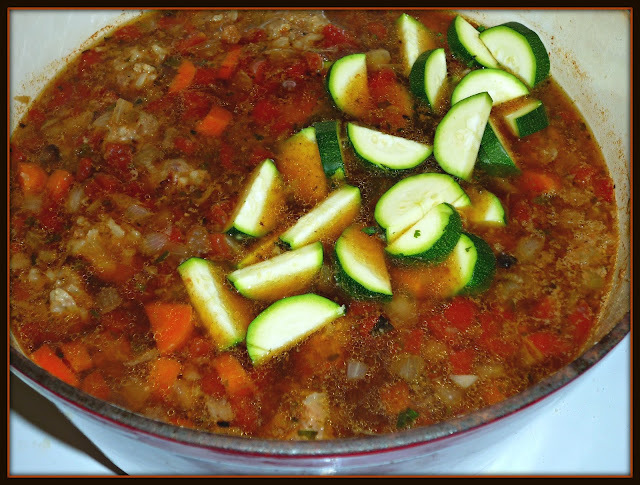 This soup is so yummy and flavorful that you'll never guess it's also lower in fat and calories! 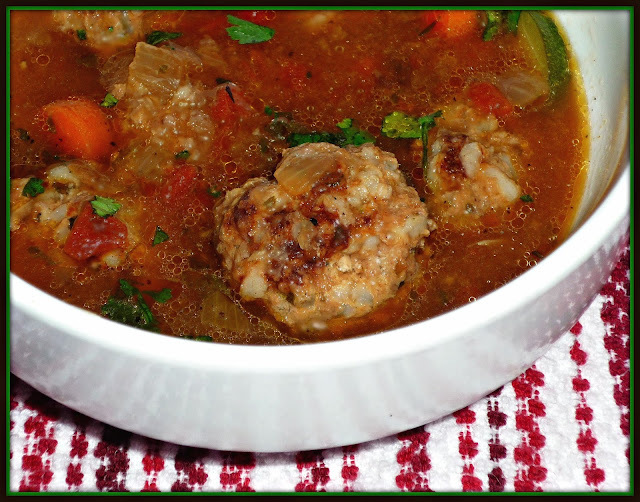 The broth is richly flavored by the meatballs, veggies, and cumin. The meatballs are moist and flavorful -- and the rice gives them additional texture and flavor. This soup is truly a meal in a bowl! If you're lucky enough to have leftovers, they taste even better the next day after hanging out in the fridge overnight. Be sure to check out all of the great Lean Beef recipes that this week's #SundaySupper Tastemakers are sharing. Whether you're looking for a salad, sandwich, or beef-centric entree...we've got you covered! Be sure to join the #SundaySupper conversation on Twitter all day today! We tweet throughout the day, and we share recipes from all over the world. Our weekly Twitter chat starts at 7:00 pm ET/6:00 p.m. CST. Follow the #SundaySupper hashtag, and remember to include it in your tweets to join in the chat. To get more great Sunday Supper Recipes, please visit our website or check out our Pinterest board. Would you like to join the Sunday Supper Movement? It’s easy! You can sign up by clicking here: Sunday Supper Movement.